Fatemi, S., Foroutan, M. (2016). Molecular Dynamics Simulations of Freezing Behavior of Pure Water and 14% Water-NaCl Mixture Using the Coarse-Grained Model. Iranian Journal of Chemistry and Chemical Engineering (IJCCE), 35(1), 1-10. Seyed Mahmood Fatemi; Masumeh Foroutan. "Molecular Dynamics Simulations of Freezing Behavior of Pure Water and 14% Water-NaCl Mixture Using the Coarse-Grained Model". Iranian Journal of Chemistry and Chemical Engineering (IJCCE), 35, 1, 2016, 1-10. Fatemi, S., Foroutan, M. (2016). 'Molecular Dynamics Simulations of Freezing Behavior of Pure Water and 14% Water-NaCl Mixture Using the Coarse-Grained Model', Iranian Journal of Chemistry and Chemical Engineering (IJCCE), 35(1), pp. 1-10. Fatemi, S., Foroutan, M. Molecular Dynamics Simulations of Freezing Behavior of Pure Water and 14% Water-NaCl Mixture Using the Coarse-Grained Model. 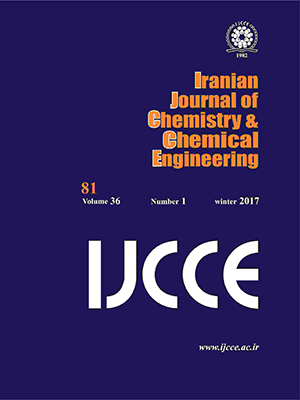 Iranian Journal of Chemistry and Chemical Engineering (IJCCE), 2016; 35(1): 1-10. We performed molecular dynamics simulations using the coarse-grained model to study the freezing behavior of pure water and 14% water-salt mixture in a wide range of temperatures for a very long time around 50 nanoseconds. For the salty water, an interface in nanoscale was used. For both systems, the freezing behavior of water molecules was studied using some qualities such as density, total energy, and radial distribution function. For the 14% water-salt mixture, the equilibrium freezing temperature depression observed in the simulations was well consistent with the experimental data. Contrary to the water-salt mixture, however, the above-mentioned quantities changed dramatically for the pure water at the freezing point. The plots of the total energy versus time shows the freezing point of 14% water-salt mixture was 265 K that is 9 K less than the freezing point of pure water. The reduction of freezing point is in very good agreement with the experimental freezing point. The results of the simulation showed that in the less temperature than obtained freezing point, the sodium and chloride ions tendency to network formation and rejection of solution lead to reduction of water molecules accumulation. Bahar S., Zakerian R., Ionic Liquid Based Dispersive Liquid-Liquid Microextraction and Enhanced Determination of the Palladium in Water, Soil and Vegetable Samples by FAAS, Iran. J. Chem. Chem. Eng. (IJCCE), 33: 51-58 (2014). Chamsaz M., Poor Zaryabi M.H., Arbab Zavar M.H., Darroudi A., Dispersive Liquid-Liquid Microextraction Based on Solidification of Floating Organic Drop Combined with Flame Atomic Absorption Spectrometry for Preconcentration and Determination of Thallium(III) in Water Samples, Iran. J. Chem. Chem. Eng. (IJCCE), 33: 59-66 (2014). Baradajee G.R., Mohamadi A., Efficient and Practical Protocol for the Synthesis of Pyridopyrazines, Pyrazines and Quinoxalines Catalyzed by La(OAc)3 in Water, Iran. J. Chem. Chem. Eng. (IJCCE), 32: 61-67 (2013). Jamaloei B.Y., Kharrat R., The Performance Evaluation of Viscous-Modified Surfactant Water Flooding in Heavy Oil Reservoirs at Varying Salinity of Injected Polymer-Contained Surfactant Solution, Iran. J. Chem. Chem. Eng. (IJCCE), 31: 99-111 (2012). Daraei A., Treatment of Textile Waste Water with Organoclay, Iran. J. Chem. Chem. Eng. (IJCCE), 32: 67-70 (2013). Berijani S., Ahmadi G., Ultrasound Assisted Surfactant Enhanced Emulsification Microextraction and Spectrofluorimetry for Determination of Oxadiazon in Agricultural Water Samples, Iran. J. Chem. Chem. Eng. (IJCCE), 33: 41-49 (2014). Xu H., Liu D.D., He L., Liu N., Ning G., Adsorption of Copper(II) from an Wastewater Effluent of Electroplating Industry by Poly(ethyleneimine)-Functionalized Silica, Iran. J. Chem. Chem. Eng. (IJCCE), 34: 73-81 (2015). Fatemi Sh S.M., and Foroutan M., Study on Formation of Unstable Clathrate-like Water Molecules at Freezing/Melting Temperatures of Water and Salty Water, Fluid Phase Equilib., 384: 73-81 (2014). Fatemi S.M., Foroutan M., Study of Dispersion of Boron Nitride Nanotubes by Triton X-100 Surfactant using Molecular Dynamics Simulations, J. Chem. Theory Comput., 13: 1450063-1450078 (2014). Fatemi S.M., Foroutan M., Study of Dispersion of Carbon Nanotubes by Triton X-100 Surfactant using Molecular Dynamics Simulation, J. Iran Chem. Soc.,12: 1905-1913(2015). Bowman J.C., Lenz T.K., Hud N.V., Williams L.D., Cations in Charge: Magnesium ions in RNA Folding and Catalysis, Curr. Opin. Struct. Biol., 22: 262- 272 (2012). Allnér O., Nilsson L., Villa A., Magnesium Ion–Water Coordination and Exchange in Biomolecular Simulations, J. Chem. Theory Comput., 8: 1493-1502 (2012). Zhang F., Wang G., Kamai T., Chen W., Zhang D., Yang J., Undrained Shear Behavior of Loess Saturated with Different Concentrations of Sodium Chloride Solution, Eng. Geol., 155: 69-79 (2013). Kleinewietfeld M., Manzel A., Titze J., Kvakan H., Yosef N., Linker R.A., Muller D.N., Hafler D.A., Sodium Chloride Drives Autoimmune Disease by the Induction of Pathogenic TH17 Cells, Nature, 496: 518-522 (2013). Corradini D., Rovere M., Gallo P., Structural Properties of High and Low Density Water in a Supercooled Aqueous Solution of Salt, J. Phys. Chem. B, 115: 1461-1468 (2011). Argyris D., Cole D.R., Striolo A., Ion-Specific Effects under Confinement: The Role of Interfacial Water, ACS Nano, 4: 2035-2042 (2010). Vincze J., Valisko M., Boda D., The Nonmonotonic Concentration Dependence of the Mean Activity Coefficient of Electrolytes is a Result of a Balance between Solvation and Ion-Ion Correlations, J. Chem. Phys., 133: 154507-512 (2010). Zhao Y., Li H., Zeng X.C., First-Principles Molecular Dynamics Simulation of Atmospherically Relevant Anion Solvation in Supercooled Water Droplet, J. Am. Chem. Soc., 135: 15549-15558 (2013). Ferrario M., Ciccotti G., Spohr E., Cartailler T., and Turq P., Solubility of KF in Water by Molecular Dynamics using the Kirkwood Integration Method, J. Chem. Phys. 117, 4947- 4953 (2002). Sanz E., and Vega C., Solubility of KF and NaCl in Water by Molecular Simulation, J. Chem. Phys. 126: 014507-519 (2007). Paluch S., Jayaraman S., Shah J.K., Maginn E.J., A Method for Computing the Solubility Limit of Solids: Application to Sodium Chloride in Water and Alcohols, J. Chem. Phys. 133: 124504-13 (2010). Moucka F., Lisal M., Skvor J., Jirsak J., Nezbeda I., Smith W., Molecular Simulation of Aqueous Electrolyte Solubility. 2. Osmotic Ensemble Monte Carlo Methodology for Free Energy and Solubility Calculations and Application to NaCl, J. Phys. Chem. B, 115: 7849-7861 (2011). Soo J., Yethiraj A., The Effect of Salt on the Melting of Ice: A Molecular Dynamics Simulation Study, J. Chem. Phys. 129: 124504-12 (2008). Aragones J.L., Sanz E., Vega C., Solubility of NaCl in Water by Molecular Simulation Revisited, J. Phys. Chem. 136, 244508-16 (2012). Vrbka L., Jungwirth P., Brine Rejection from Freezing salt Solutions: A Molecular Dynamics Study, Phys. Rev. Lett., 95: 148501-504 (2005). Kim D.H., A Review of Desalting Process Techniques and Economic Analysis of the Recovery of Salts from Retentates, Desalination, 270: 1-8 (2011). Nagashima K., Furukawa Y., Time Development of a Solute Diffusion Field and Morphological Instability on a Planar Interface in the Directional Growth of Ice Crystals, J. Cryst. Growth, 209: 167-174 (2000). Mancinelli R., Botti A., Bruni F., Ricci M.A., Soper A.K., Perturbation of Water Structure Due to Monovalent Ions in Solution, Phys. Chem. Chem. Phys., 9: 2959-2967 (2007). Timko J., Bucher D., Kuyucak S., Dissociation of NaCl in Water from ab Initio Molecular Dynamics Simulations, J. Chem. Phys., 132: 114510-18 (2010). Moliero V., Moore E., Water Modeled as An Intermediate Element between Carbon and Silicon, J. Phys. Chem. B, 113: 4008-4016 (2009). DeMille R.C., Molinero V., Coarse-Grained Ions Without Charges: Reproducing the Solvation Structure of NaCl in Water Using Short-Ranged Potentials, J. Chem. Phys. 131, 034107-16 (2009). Stillinger F.H., Weber T.A., Computer Simulation of Local Order in Condensed Phases of Silicon, Phys. Rev. B, 31: 5262-5271 (1985). Carre A. Berthier L. Horbach J. Ispas S., Kob W., Amorphous Silica Modeled with Truncated and Screened Coulomb Interactions: A Molecular Dynamics Simulation Study, J. Chem. Phys., 127: 114512-20 (2007). Plimpton S., Fast Parallel Algorithms for Short-Range Molecular-Dynamics. J. Comput. Phys., 117: 1-19 (1995). Garignano M.A., Shepson P.B., Szleifer J., Molecular Dynamics Simulations of Ice Growth from Supercooled Water., Mol. Phys. 103: 2957-2967 (2005). Fernández R.G., Abascal J.L.F., F Vega C., The Melting Point of Ice Ih for Common Water Models Calculated from Direct Coexistence of the Solid-Liquid Interface, J. Chem. Phys. 124: 144506-11 (2006). Jorgensen W.L., Jenson C., Temperature Dependence of TIP3P, SPC, and TIP4P Water from NPT Monte Carlo Simulations: Seeking Temperatures of Maximum Density, J. Comput. Chem. 19: 1179-1186 (1998). Lide D.R., "CRC Handbook of Chemistry and Physics" (86th ed. ), Boca Raton (FL): CRC Press (2005).